Every organization is on — or should be on — a Digital Transformation journey. 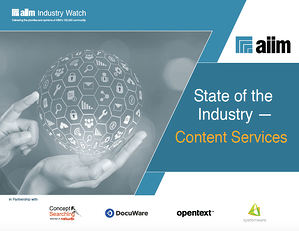 In this eBook, we take a look at the current state of Content Services technologies (records management & preservation, document management, multi-channel capture, content migration, integration & collaboration) and how user perceptions about them are changing. What kinds of critical information management problems are users trying to solve with Content Services? How is automation revolutionizing user expectations about records management and information governance? Simply fill out the form on this page to download this free report and learn more. Concept Searching, DocuWare, OpenText, and Systemware, Inc.